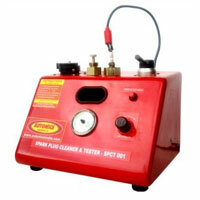 The company is counted among the prominent Manufacturers, Exporters and Suppliers of Spark Plug Cleaners (Royal-TX) in Faridabad. The Spark Plug Cleaners (Royal-TX) are known for providing the best and most efficient assistance to the users and can be relied upon for the different industrial processes they are used in. Separate plug cleaning chamber consisting of an abrasive system connected to Double acting valve for blasting and subsequent cleaning to remove the abrasive and dust. Different rubber adopters provided for cleaning plugs of 10 mm, 12 mm, 14 mm and 18 mm sizes. Twin testing chamber connected to the compressed air system for charging the chamber with the necessary control device. Pressure Regulator is provided for reducing any excess air and releasing pressure in the chamber. Overall Weight : 12 kg.